I must have made a million phone calls since I started selling vehicles in 1996. Today, now that I am a Sales Manager, I still take and make phone calls to customers. Like many things in Automotive Sales, phone skills are usually learned through trial and error. Many sales people have had little or no training on the phone. They may have had some word tracts passed to them from their manager or other sales people but that is where their training ends. Others may have had a trainer come in and share proper techniques and word tracts. Calling and talking on the phone is not natural for a lot of sales people. It can be boring, monotonous, and painful. You get hung up on, yelled at, ignored, and abused. This is where call reluctance usually comes into play. Sales people would rather stand on the lot and wait for a fresh up to come to them, instead of sitting in a stuffy call center or office hammering out calls. It is becoming more and more difficult to reach your customer and control them over the phone. Customers know that they have the “distance” between them and you. They are more likely to be untruthful about their intentions. They are more likely to want all of the information possible without having to bridge that distance and come into the dealership. I compiled the information in this book, to help sales people prepare for any phone call and to increase their skills so that they can get more customers to come to them. In 2000 I became the Business Development Manager for my dealership. I set up the call center and instituted our calling best practices. I trained incoming phone call scripts, follow-up guides, and prospecting guides to our sales people. I made a ton of Public Relations Manager calls, took sales incoming calls, and prospected orphan owners. As a Sales Manager, I make these calls to this day. In this Automotive Sales Phone Playbook I break down the finer elements of phone sales etiquette, how to properly handle incoming phone calls, leave effective messages, conduct proper prospect follow-up, and most of all prospect for more sales. You will learn word tracts, skills and techniques that will help you strengthen your phone work and help reduce call reluctance. There is nothing worse than not being prepared to take or make a phone call. You might as well not do it at all! The average dealership spends $250 - $300 per customer in advertising (sometimes more) to attract a customer and get them to inquire with the dealership. So, if each customer that calls in costs $300, don’t you think you had better be on your best to handle that call for your dealership? It is the “hottest” lead (next to a fresh walk-in customer) and the most important lead to handle correctly. You can always get a turnover with a customer on the floor, but it is more difficult to get a T.O. with a customer on the phone. You only have a few seconds to make a good impression and to control the customer without having them feel like you are controlling them. If don’t start off right, you will be holding the receiver with a dial tone on the other end. If handled properly you will set more appointments and be able to follow-up your phone prospects, that did not set an appointment or come in. Now, a dealership spends less advertising money on retaining satisfied customers. (Usually half) So the second most important call is the owner base call. What are you doing right now to contact all of your past customers? What is your dealership doing right now to contact all of your orphan owners? Are you getting your owner base working for you and taking advantage of your referral program? There are a lot of things you could be doing, that are easy, when making your calls. Also, a good sales person knows what their closing ratio is. They know how many people it takes to get in front of in order to sell the number of cars they want to sell in a month. So, if it takes 30 customers to sell 10 vehicles with a 30% closing ratio what are you gong to do if you only get fifteen to twenty fresh customers in a month? A top sales person knows that they will have to prospect. This is done either with lost opportunities from previous weeks and months, or cold calling. From working in insurance for three years, I know what I would rather do. I hate cold calling. I still have nightmares with phone books attacking me in my sleep. A “warm” opportunity is better than a “cold call!” It still don’t understand it when a sales person lets a customer go with the hope that they will return. It blows my mind even more when they don’t follow up with the customer. On top of it all, I cannot fathom it, when this is done with multiple customers. So, let’s go back to the question; where do you find more customers? You prospect. If you get in front of 30 customers a month and sell at a 30% close you have 20 customers left unsold. Add that up over several months, you have a good list of “warm” prospects. Everything compounds. If you add your phone up’s that didn’t buy, your owners that you can ask for referrals, orphan customers who don’t have a sales person any more to your lost opportunities, you will have enough people to call to add to your sales in a down month. What are you going to do? Are you going to learn the skills in this book and put them to work? Or, are you going to stand out in the wolf pack and wait to pounce? What sets top sales people aside from the rest? They know how to work the phones. 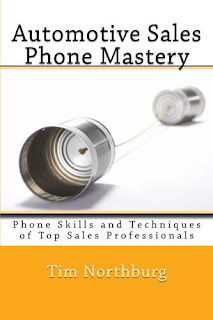 This complete playbook walks you through the various phone calls, word tracts, and objections an Automotive Salesperson takes, makes, and handles many times each day. Master the phone and sell more vehicles.